Listening is not enough. In business settings or personal relationships, you must convince your counterpart you are listening. No matter how much attention you are paying, if she doesn’t feel heard, your efforts will be in vain. Listening is far more than capturing information. 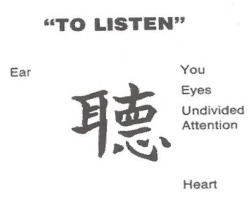 Listening demonstrates curiosity, respect and care. It establishes a constructive environment where you can address the issue together. That is, if you can show each other that you are really listening. 0. Listen. Unless you really listen, you are lying. Are you really curious? Do you have space inside your mind for your counterpart’s perspective? Unless you hold your view lightly, listening to the other will feel like a waste of time. Why bother? You already know! 1. Focus. Look at her. Don´t do anything else. Have you ever talked to someone who is on his phone, emailing at the same time? “Go on, I’m listening,” he’ll say. But that just doesn’t cut it. And how do you feel when your counterpart repeats everything and grins, “Told you. I am listening!” in a snarky tone? 2. Be quiet. Let her finish. Don’t interrupt. 3. Encourage. Nod. Say “Mhmm.” Paraphrase. If you are quiet and keep a poker face, she won´t know if you are with her. Quietly nodding or paraphrasing encourages her to present her views fully. Your silent attention creates a vacuum that she will fill up with meaning. 4. Summarize. Play back her essential point. Attributing the summary to the other will allow you to accept her perspective, even if you don´t agree with it. When you say, “I understand that you prefer that we change priorities,” you are not agreeing that it would be best to change priorities. 5. Check. Ask her if you got her point, and let her correct you. You may have not gotten the gist of her argument. Perhaps you misunderstood, or perhaps she misstated it. Either way, by checking you give her a chance to sharpen or expand her thoughts. 6. Validate. Acknowledge she has a point. 7. Inquire. Ask her what she would like from you. You can’t read her mind, so you don’t know what she wants. If you assume you do, it’s hit and miss, mostly miss. There are a myriad reasons to engage in conversation; you are on much safer ground if you ask her. These steps are simple, not easy. They require conscious effort, especially when stakes are high. They also require discipline. Blurting out your view is as gratifying as it is self-defeating. You will never convince anybody that you know unless you first convince her that you care. Fred Kofman encourage participants in his seminars to go home, ask their spouses, “How was your day?” and listen like this. It is amazing what they report the next day. If you are willing to try it, let us know how it goes.